Flowers have been used to express feelings like love, passion, friendship, celebration and even grief. Now, you get the chance to bring these emotions into your living room with our range of floral décor options. Sit back and choose through options with different colors, forms, sizes, and shapes waiting to infuse incomparable exuberance in your décor. Our Floral Décor artworks are the best option to give the interior space an instant and passionate facelift. 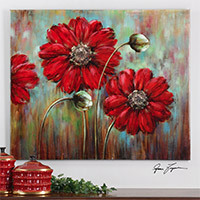 Available in monochrome and colorful patterns, you have many options to choose from—the vibrantly designed Scarlet Poppies Floral Art or the classically themed Marche De Fleurs On Black Framed Art. Our collection is very different from the current standards for floral art décor. Here, the emphasis is on making an exclusive statement and offering value for your money. We don't push through discounted items or lure you with specially recommended options. We believe in helping you make a better choice by listing the products with relevant information! Floral Decor There are 100 products.